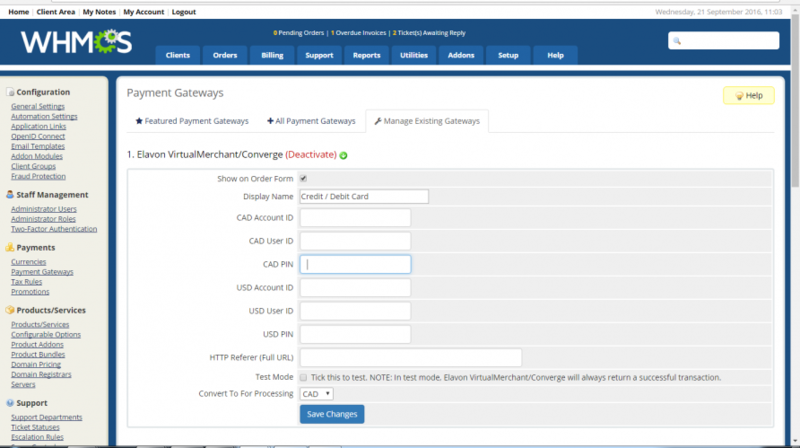 This module enables you to accept credit card transactions through the Virtual Merchant/Converge gateway provided by Elavon and its associated resellers (Costco and others). Supports both CAD and USD accounts and will use them intelligently based on currency settings if both are configured. It supports one time and recurring payments, as well as refunds through the WHMCS admin interface. As with most other merchant gateways, all transactions are handled by WHMCS directly and customers will not have to leave your website in order to complete transactions. We also support setting up HTTP referrers in the module settings so that you can configure Converge to only accept transactions from a pre-approved list of websites. This will help to prevent fraudulent users from submitting transactions from their websites, claiming to be you. We also provide a test mode to run transactions against a sandbox” account from Converge. A test mode in their live environment is also available as an option from them. When enabled, transactions will not be forwarded to the credit card processor, but instead will always return an APPROVED result. This is a nice feature to test and configure your system. No special server configuration needed. Requires PHP 5.6+ and WHMCS 7.0 or newer. You will need a Merchant ID, a User ID and a User Pin. This information will be provided by your merchant. By default, Elavon turns on the Auto Pend Filter for returns and causes refunds to go into a pending state despite telling us that it was successful. To turn this feature off, which will be required for performing refunds via WHMCS, log into Converge at myvirtualmerchant.com as your Converge admin user. Go to Terminal > Advanced > Fraud Prevention Rules. Click on Auto Pend Filter, uncheck the box and click Update. For any refunds that have already submitted to Elavon and may be pending, go to Current Batches > Main > Credit Card. Select the check box beside any Pended items with a type of "Return" and click Unpend. It is $7.50 quarterly with free support & updates for as long as your service is Active. Download the zip file from our client area and follow the instructions in the INSTALL.txt file included. There are a couple of products for Elavon and WHMCS, this is a good one. I found the developer of this module and the Elavon team to be very professional. Thank you for your kind words Perry! We look forward to continuing to serve your business needs. Rewrote refund function to use Elavon's CCRETURN API instead of CCCredit. No more needing to store the credit card number for refunds! *Bug fix: fallback for licensing checks in case server variables are not defined. Recommended update. Bug fix: only pass the "currency" parameter to Elavon if needed for the payment (for example: if you are using a CAD account and the payment is going to be CAD, we will not pass it). This means that you do not always need the Multi-Currency feature turned on in your account.